What do you get when you combine robots with neon see-through plastic? You get Poo-chi. Whether you remembered him or not, he was the best low-effort pet a parent could buy for their kid! 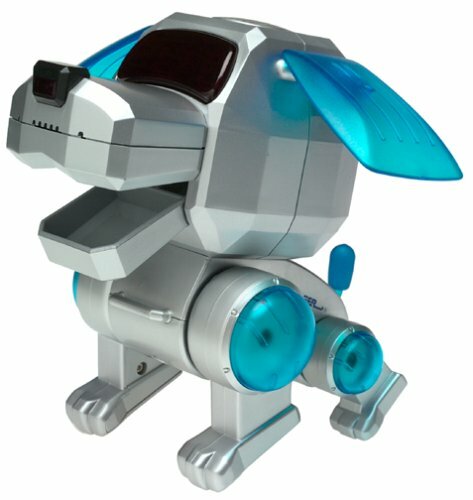 This lovable mechanical dog sang songs, had a robo-bone you could give him, and came in four fashionable translucent neon colours - teal, hot pink, green, and pink. They could also sit down or stand up, and had red LEDs displaying their "emotion" for eyes. Shortly after they came out, McDonald's ran a promotion where you could get them in more colours in a Happy Meal. Just like Beanie Babies though they didn't have the same quality to them and were noticeably smaller (probably has to do with being a cheap plastic toy you get for free). Poo-chi was superseded by the less popular Meow-chi (which actually was more effort than a real cat) and Dino-chi, despite dinosaurs being awesome. They also had Baby-chi, which was probably the most frightening thing ever.